Duffy’s Lucky Escape will transport you to a tropical paradise where Duffy the Sea Turtle lives amongst beautiful coral reefs and colourful fish only for Duffy to learn that not all that floats is food. As time is running out Duffy has a lucky escape when kind people step in to save the day. A positive, inspiring, beautifully illustrated true story about the problem of ocean plastics with a happy ending. 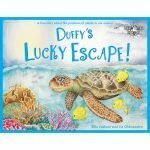 Launched in September 2017 and already loved by over 500,000 children, teachers and parents worldwide, Duffy’s Lucky Escape is the engaging story of the relationship between humans and wildlife and the dangers sea turtles face in their own natural habitats. Stunning artwork captures the imagination of young readers and brings to life a very real threat ocean plastics pose to our oceans. Duffy’s Lucky Escape is based on true events and it is this powerful message which invites children and adults alike to question their environment and the plastic pollution within it. With suggestions for the future and links to activities which reinforce the story, Duffy’s Lucky Escape is a book which will inspire young readers to make changes to the world around them. The Wild Tribe Heroes books have received personal letters of congratulations from Sir David Attenborough and Prince Charles who are both extremely concerned about the issue of ocean plastics and are doing everything they can to help raise awareness. The books have been featured on the BBC, in The Guardian, Mail on Sunday and Huffington Post as well as numerous local newspapers, radio and TV and also featured in international podcasts, blogs and press. 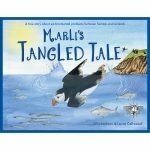 Marli’s Tangled Tale takes you to the cool and green cliffs where Marli the Puffin lives with her soon to hatch egg until one day the excitement of the far away town visits in an unexpected way. As hope starts to fade her tangled tale takes a twist just in time for the surprise waiting for her back at home! A positive, inspiring, beautifully illustrated true story about the problem of balloon releases with a happy ending. Following on from the success of Duffy’s Lucky Escape, the first book in the Wild Tribe Heroes series, Marli’s Tangled Tale is the engaging story of the relationship between the actions of humans and wildlife and the dangers they face in their own natural habitats. Marli’s Tangled Tale is perfect as a bedtime story or to share with your school or preschool. It is an engaging story based on the true tale of a little puffin who becomes entangled in balloon litter. Stunning artwork captures the imagination of young readers and brings to life the very real threat balloons from balloon releases pose to our environment. Marli’s Tangled Tale shares a powerful message which invites children and adults alike to question their actions and the effects on our environment. With suggestions for alternatives to balloon releases and ideas for the future together with activities which reinforce the story, Marli’s Tangled Tale is a book which will inspire your own little Wild Tribe Hero to want to take care of nature and their environment by making changes to the world around them. The third book in the Wild Tribe Heroes series, Nelson’s Dangerous Dive is the engaging story of the relationship between the actions of humans and wildlife and the dangers they face in their own natural habitats. 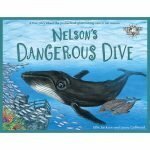 Nelson’s Dangerous Dive is perfect as a bedtime story or to share with your school or preschool. It is an exciting story based on the true events after a humpback whale became entangled in ghost fishing nets. Stunning artwork captures the imagination of young readers and brings to life the very real threat lost or abandoned fishing nets pose to our environment. Nelson’s Dangerous Dive shares a powerful message which invites children and adults alike to question their actions and the effects on our environment. With suggestions to support sustainable fishing and ideas for the future together with activities which reinforce the story, Nelson’s Dangerous Dive is a book which will inspire your own little Wild Tribe Hero to want to take care of nature and their environment by making changes to the world around them. Over 500,000 children around the UK in libraries, schools and preschools have been using the Wild Tribe Heroes books to learn about the problem of ocean plastics. Through our Books Into Schools project, local businesses, individuals, organisations, councils, parents and grandparents can help inspire thousands of children across their community to get involved and take action. Each school receives an Educational Pack of the three books plus teaching ideas and digital resources and the aim is to target an entire region at the same time. The result of children reading the books in schools is remarkable. They are organising litter picks and beach cleans, setting up recycling stations and importantly, using their persuasive writing skills to write to local business asking them to stop their use of single use plastic. Between these thousands of children they will have links to every single business in the community and so the children become the teachers, inspiring their families,schools and wider business communities to make the changes our environment so desperately needs us to make. This is creating cleaner and healthier towns and environments, coastal regions and cities. To find out more about how you, your school or your business can help sponsor the books into your local community please click here. Together, we can all be the change we want to see. The Wild Tribe Heroes books have received personal letters of congratulations from Sir David Attenborough and Prince Charles who are both extremely concerned about the issue of ocean plastics and are doing everything they can to help raise awareness. To receive letters from two of the world’s strongest advocates for the environments was an incredible moment for Ellie who is extremely proud to be part of so many inspiring people working hard to help stop ocean plastic. Ellie Jackson has been shortlisted as a Finalist for the Cornwall Sustainability Awards 2018 which recognises the work of individuals and businesses who have had real success in raising awareness of the problem of ocean plastic. Over 8,500 copies have been sold around the world in just over a year, particularly in the UK, Australia & New Zealand and the USA. They are being translated into many different languages including Welsh, French, Hindi, Indonesian, German, Spanish, Turkish, Norwegian and Arabic which are currently available as ebooks. They are stocked with the National Trust, RNLI, Eden Project, Falmouth Maritime Museum, Surfers Against Sewage, 2 Minute Beach Clean, Marine Conservation Society UK, Wildlife Trust and Fathoms Free as well as many book shops, museums, art galleries, gift shops, zero waste and farm shops around the country as well as numerous online stores.